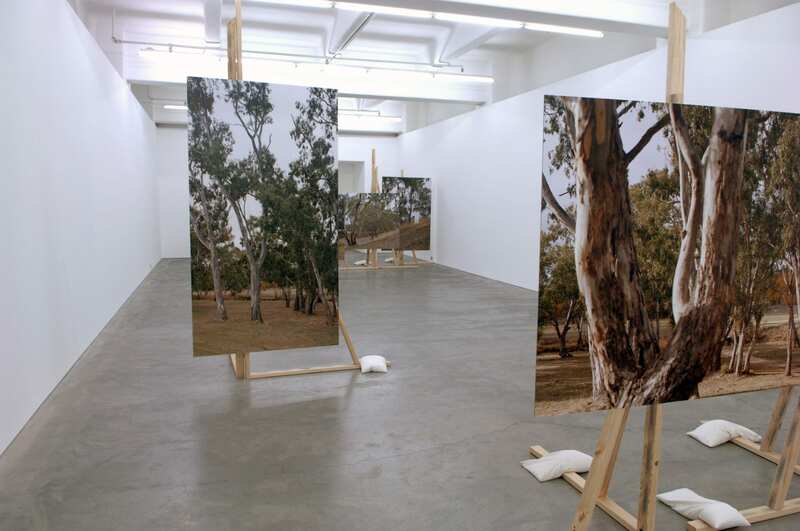 Image credit: Lyndal Jones, Bridge of No Return, 2008, (image from installation at Anna Schwartz Gallery), photographs mounted on aluminium, pine stands, sandbags, timber platform, audio program (digital, 10 mins), headphones. Dimensions variable. Collection of the artist. ‘The Bridge of No Return’ is a small wooden bridge that crosses the demarcation line between North and South Korea in the Demilitarized Zone (DMZ). When prisoners of war from the Korean War chose to return to North Korea in 1953, they were told that, once they walked over this bridge, they could never return. The bridge thus became known as ‘The Bridge of No Return’. After ‘the Axe Murder incident’ in 1976, when a US soldier was killed by a group of North Korean soldiers who rushed across the bridge and killed him with the axe he was using to trim a tree that was blocking the sight of the north side, the bridge was closed. ‘The Bridge of No Return’ was pointed out, and its story told, by a US soldier to a group of 40 international artists, including Jones, during a special tour of the DMZ. The artists were in South Korea undertaking research for the exhibition DMZ 2005 curated by Yu Yeon Kim. After hearing the story, Jones made a video installation she called “The Axe Murder Incident’ for inclusion in the exhibition on the South Korean border. This work included recordings of birdsong from Avoca in central Victoria (the site of The Avoca Project, her 15 year work on climate change) that she had taken to South Korea as a contribution to the bird sanctuary that the DMZ had famously become. This was to be the first work of The Avoca Project. Jones brought back the audio recording of the US soldier (with Korean translation), telling the story of the DMZ border to create a work about borders in Australia. Her resulting artwork, The Bridge of No Return, was first shown at Anna Schwartz Gallery in 2008 as part of The Avoca Project. In this photographic installation there is another small, white, wooden bridge that this time crosses a river – the Avoca River – in front of Watford House, the house central to The Avoca Project. Now, in 2019, with the recent deaths of millions of fish in the Murray-Darling basin highlighting the struggle over water rights that has only escalated since this time, this exhibition of The Bridge of No Return reveals itself to be prescient.